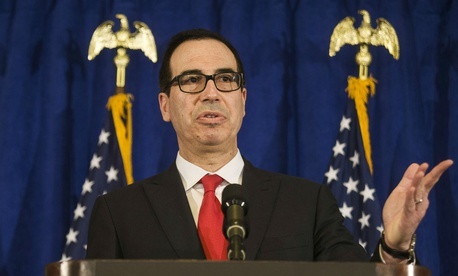 After weeks of media coverage suggesting he unnecessarily used military transport for travel, Treasury Secretary Steven Mnuchin on Thursday got a clean bill of health from the department’s inspector general. Following a review of seven questioned flights that was twice-expanded in September, Treasury Inspector General Counsel Rich Delmar on Oct. 4 wrote to IG Eric Thorson he sees “no violation of law in these requests and uses. Getting approval from appropriate White House officials to designate the trips as White House Support Missions places them out of the purview of OMB Directive A-126 [issued in 1993] and otherwise applicable limitations in the Federal Travel Regulation,” Delmar wrote. “And the clarified basis for the request associated with the August personal travel is consistent with the demonstrated requirement that the secretary have access to secure communications even during personal travel,” he said in a document that reviews details of seven Mnuchin flights, an eighth he has requested, and a ninth that was withdrawn. Mnuchin—one of a half-dozen Trump Cabinet members whose use of taxpayer funds for private or expensive government airline flights is under scrutiny—was criticized most notably for using a government aircraft for an August trip to the U.S. Mint’s Bullion Depository in Kentucky at the time when that site was prime viewing territory for the solar eclipse. He also had requested a government plane to take him and his new bride on a honeymoon—a request later withdrawn. Politico has estimated the costs of his military transport travel at $811,797.81. Reviews of documents, policies and discussions with officials led the IG to conclude that “all were requests made to the White House for designation as White House Support Missions. We were told by a Treasury [Office of General Counsel] official that the department followed procedures propounded by the White House when it requested use of government aircraft for the secretary’s travel.” A White House support mission must be directed by the president. The flights’ propriety was discussed only briefly in the department, and the upshot was not relayed to decision-makers at the White House, Delmar added. On Sept. 29, Budget Director Mick Mulvaney issued new guidance reminding agency executives to watch travel costs and that just because a flight may be legal doesn’t make it right. Unlike Tom Price, the Health and Human Services secretary forced to resign under fire last month, Mnuchin has not been using private charter flights. In a separate development, the Housing and Urban Development Department shot down suggestions that family members of Secretary Ben Carson are accompanying him on official business at taxpayer expense. Carson’s wife Candy and one of his sons, investment firm founder Ben Carson Jr., have been seen on road trips with the secretary and at HUD headquarters, as reporters have noted.